We survey and assess the empirical literature on the sources of corruption Thanks to the improved availability of data, we are able to produce an improved cross-country econometric model to test well-established and more recent hypotheses jointly. We do not find that the common law system, or a past as a British colony predicts corruption. 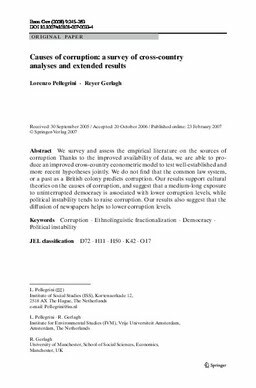 Our results support cultural theories on the causes of corruption, and suggest that a medium-long exposure to uninterrupted democracy is associated with lower corruption levels, while political instability tends to raise corruption. Our results also suggest that the diffusion of newspapers helps to lower corruption levels.